The basis for the design of the medals is the main Sochi 2014 brand concept - the contrasts of our incredible country in which Europe meets Asia, pristine nature and megacities coexist, and innovation blends with a rich cultural heritage. The sun's golden rays deflected through a prism of snowy mountain tops and the warm sea and frosty ice living side-by-side are embodied in the medals. These contrasts in Russia's natural landscape will be an eternal souvenir for the champions and will be a reminder of the unforgettable Games in Sochi. The medals of the Sochi 2014 Olympic Games have been given a bright and original design. The medals have been engraved with the signature "Patchwork Quilt" of the Games - a mosaic of national designs from the various cultures and ethnicities of the Russian Federation. The unusual combination of glass and metal gives the artifact a lightness and unique beauty. 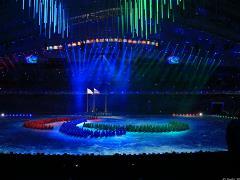 3500 athletes will compete for the Sochi 2014 Olympic and Paralympic medals. Products made from precious alloys are used to produce the Sochi 2014 medals and an ecologically clean alloy of copper and zinc is used for the bronze medals. All the metals come from Russia. During the manufacture of medals, a combination of manual work (polishing) and ultra-modern technology is used (the "patchwork quilt" design is applied with a laser inside the transparent polycarbonate material). The thickness of each medal is 10 mm, and diameter - 100 mm. 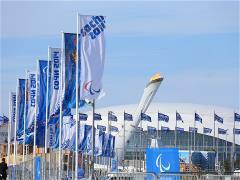 The weight of the Sochi 2014 Olympic medals is from 460 to 531 grams, and the Paralympic medals from 585 to 686 grams. 1300 medals will be produced, total weight is more than 700 kg. No less than 2.5 kg of gold with a 999 hallmark, 490 kg of silver with a 960 hallmark and 210 kg of bronze will be used to make the medals. Leading advertising agencies, jewelers, clockmakers, licensees and Russian designers took part in the competition for the design of the medals. A total of 11 designs were proposed. From these, the expert panel chose the design that corresponded the most to the Sochi 2014 brand concept (the contrasts and multifaceted nature of the Russian character). The obverse of the medal depicts the Olympic rings, the reverse has the competition name in English and the Sochi 2014 emblem inscribed on it. On the edge medals have the official name of the Games inscribed in Russian, English and French. Paralympic medals are designed in the same style as the Olympic medals. The obverse of the coin depicts the Paralympic symbol ("agitos"), and the reverse shows the emblem of the Sochi 2014 Paralympic Winter Games as well as the competition name inscribed in English. The Paralympic medals contain inscriptions in Braille, used by the visually impaired for reading. One of the most difficult and labor intensive complex technological solution is used for the production of Sochi 2014 medals. The process can be divided into several core stages: Semi-continuous casting, cutting, turning, electromachining, precision cutting and etching of the metal. The thick plate of metal is casted through a method of semi-continuous casting. Air pores can develop during the casting process. To avoid this from happening, the cast metal is rolled in a multi-tonne rolling mill. The medal is later made from the rolled cast metal. After that comes the mechanical processing - turning, electroerosion cutting, high-speed precision cutting and etching. The result is a semi-finished product prepared to the highest degree. It becomes a finished product when the edges of the medal are polished and several finishing processes take place. Production of one medal takes up to 18 hours on average. 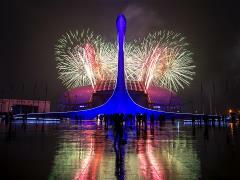 The Official Supplier of precious metals for Sochi 2014 and the medals producer is Adamas.